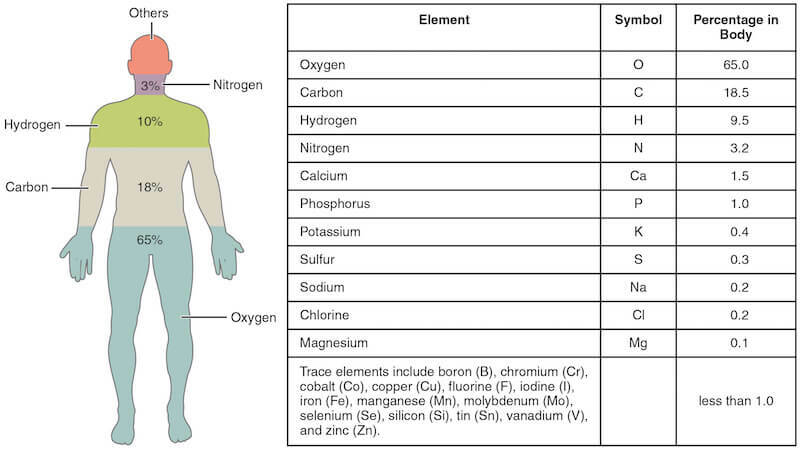 Oxygen makes up about 65% of the mass of the adult body—most of this is in the form of water. Oxygen also makes up approximately 50% of the mass of the Earth’s crust and 21% of the atmosphere (air)—the rest of the atmosphere is mostly nitrogen (78%). The Earth is the only planet in the solar system with a high percentage of oxygen. Oxygen is critical for chemical reactions that keep the body alive, including the reactions that produce adenosine triphosphate (ATP)—the molecule used for energy. Brain cells are sensitive to a lack of oxygen because of their demand for a high-and-steady production of ATP. Brain damage is likely within five minutes without oxygen (cerebral hypoxia), and death is likely within ten minutes. A steady supply of oxygen is indispensable for cardiac function and viability. An adult human, at rest, inhales 1.8 to 2.4 grams of oxygen per minute. This amounts to more than 6 billion tonnes of oxygen inhaled by humanity per year. At a resting pulse rate, the heart consumes approximately 8-15 ml O2/min/100 g tissue. This is significantly more than that consumed by the brain (approximately 3 ml O2/min/100 g tissue) and can increase to more than 70 ml O2/min/100 g myocardial tissue during vigorous exercise. The molecular formula for oxygen is O~2~, which represents the chemical bonding of two oxygen atoms. Dioxygen is the physical form, or allotrope, of oxygen that surrounds us, and trioxygen is the oxygen that is known as ozone (O~3~)—this allotrope is highly reactive and damages lung tissue. In comparison to nitrogen, oxygen is more water-soluble; therefore, water contains more oxygen than would be expected from the nitrogen-rich atmosphere. Water (H~2~O) is the most prominent and well-known oxygen compound. Oxygen has an electronegativity that causes it to form chemical bonds with just about every other element when at elevated temperatures. Cold water can hold more dissolved oxygen than warm water, and fresh water can contain more dissolved oxygen than salt water. Consequently, the warmer and saltier the water, the less dissolved oxygen there will be. Oxygen is an odorless, colorless gas when at the standard pressure and temperature. Oxygen condenses at –297.4°F (–183.0°C) to a pale blue liquid (liquid oxygen) and upon further cooling, freezes at –361.9°F (–218.8°C). Oxygen that occurs naturally has three stable isotopes: 16O, 17O, and 18O. The most abundant isotope is 16O and is mostly synthesized in massive stars after the hydrogen fusion process. After hydrogen and helium, oxygen is the third most abundant element in the universe. The biogeochemical cycle of oxygen occurs within three main reservoirs: the atmosphere, the biosphere (all life on this planet), and the Earth’s crust. Plants are the primary creators of atmospheric oxygen through the process of photosynthesis. In the example of the oxygen cycle below, you can see how oxygen is used and cycled by plants. The cycling of carbon and oxygen is interconnected. 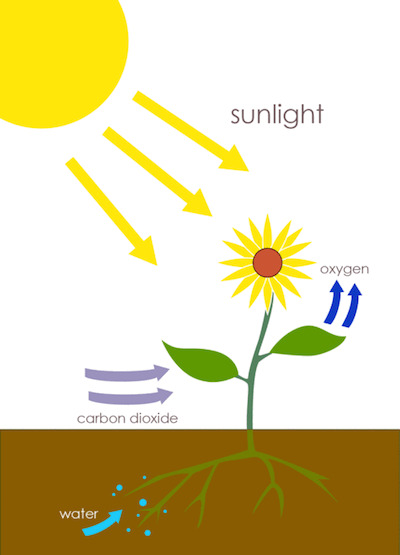 Plants uses carbon dioxide (CO~2~) and sunlight to convert and release energy and oxygen. Humans and animals breathe in oxygen and then breathe out carbon dioxide—plants then use this carbon dioxide to restart the perpetual cycle. Breathing – During respiration, air passes through the bronchial tubes, or airways, into the lungs for gas exchange, or diffusion, to take place—the exhalation of CO~2~ makes room for the absorption of O~2~. Decomposing – When animals and plants die, they decompose—this process uses up O~2~ and releases CO~2~. Rusting – This is also known as oxidation—when things rust they use up O~2~. Combustion – Three things are necessary for fire: oxygen, fuel, and heat. When things burn, they use O~2~ and replace it with CO~2~. Contrary to popular belief, oxygen is not explosive; nevertheless, patient education is imperative because oxygen accelerates combustion. Plants – Produce O~2~ through photosynthesis. Sunlight – Some production of O~2~ occurs when sunlight reacts with water vapor in the atmosphere. Since the start of the Industrial Revolution, humans have increased the CO~2~ concentration in the atmosphere through activities such as cutting down trees, land use changes, and burning fossil fuels. NASA states, “This [increase of CO~2~] is the most important long-lived “forcing” of climate change.” Carbon dioxide lives in the atmosphere for thousands of years. Each person has a carbon footprint, which is the amount of greenhouse gases directly and indirectly emitted by an individual’s daily activities. Household Carbon Footprint Calculator – Take a few minutes to find out your carbon footprint. Carbon neutral – This is offsetting enough CO~2~ to neutralize the amount of pollution people and businesses are responsible for. This is the current stance for most people and business’ and whilst it is a good start. Carbon negative – An activity that removes more CO~2~ from the atmosphere than a person is responsible for producing, which is optimal. Individuals and companies can invest in renewable energy generation or other carbon emission reduction projects, such as planting a bunch of trees, to become carbon negative. 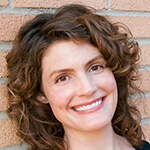 Why Did Pacific Medical Training Become Carbon Negative? All the things that humans do generally upset [the ecosystem’s balance]…We have done these things with such reckless abandon that it is starting to impact Earth’s natural systems. Humans have a responsibility to understand their own personal contribution to this balance. And doubly so for industrial concerns, like businesses. Philo of Byzantium, a Greek writer and engineer in the second century, conducted the first experiment of the relationship between air and combustion. He found that if you take a burning candle on a dish full of water and invert a cylindrical container over it, the surrounding water will rise into the neck of the vessel. The first discovery of oxygen in the 1600s, by the Polish alchemist Sedziwoj, was not published. Scheele then rediscovered oxygen, followed by Priestly in the 1770s. In the nineteenth century, scientists realized that by compression and cooling, they could liquefy oxygen. By 1891, scientists could produce enough liquid oxygen for research. Four years later, the first process to generate liquid oxygen was commercially viable. More than 50% of the world’s steel production uses the basic oxygen process (BOP), which employs pure oxygen to convert scrap and iron into steel. Other applications of oxygen in the industrial setting include making or processing new compounds such as plastics, paper, glass, ceramics, pharmaceuticals, and petroleum. Liquid oxygen is combined with liquid hydrogen to make rocket fuel. Oxygen has various uses in health care—treatment is flexible enough for use in inpatient, outpatient, and in emergency settings. It treats ailments such as heart disorders, pneumonia, and chronic obstructive pulmonary disorders (COPD). The circulatory system is interconnected with the pulmonary circulation. Treatment not only increases the oxygen saturation of the blood but also can ease cardiac workload. When providing life support, airway care and rescue breaths improve a person’s chance for survival, as in this life-saving story. Other life support use includes oxygen supplementation for astronauts and scuba divers. There are several approved indications for 100% oxygen at pressures greater than atmospheric pressure, such as in the use of hyperbaric oxygen therapy for treating divers suffering from decompression sickness. Hyperbaric oxygen therapy (HBOT) is a common prescription for healing wounds in a person with vascular insufficiency. False claims about HBOT therapy are all over the internet—it has not been approved to treat or cure cancer, autism, or diabetes. Ozone is a reliable agent for water sterilization as it has a proven record of destroying pathogens. Because of its ability to kill pathogens, medical O~3~ is purported to treat numerous pathogenic diseases. Application varies from intravenous infusion, to rectal insufflation, to topical use. Ozone is a toxic gas with no known useful medical application in specific, adjunctive, or preventive therapy. In order for ozone to be effective as a germicide, it must be present in a concentration far greater than that which can be safely tolerated by man and animals. Oxygen has also found its way into recreational use. Oxygen bars offer oxygen exposure that is higher than normal for a fee. It is touted to produce mildly euphoric experiences; however, research doesn’t back this claim. At elevated partial pressures for prolonged periods of time, oxygen can be very toxic; it can cause convulsions and many other health problems. Contact with liquid oxygen can cause skin and eye irritation as well as burns and frostbite. In the early to mid-1900s, it was a common therapy to place premature babies in incubators with a high percentage of oxygen; this ceased when a correlation was found between this practice and a blindness called retinopathy of prematurity (ROP). Oxygen supplementation improves the prognosis in majority of patients admitted to intensive care units; however, a lack of careful oxygen management may place patients at risk for hyperoxia (excess supply of oxygen). Hyperoxemia—Too Much Of a Good Thing? 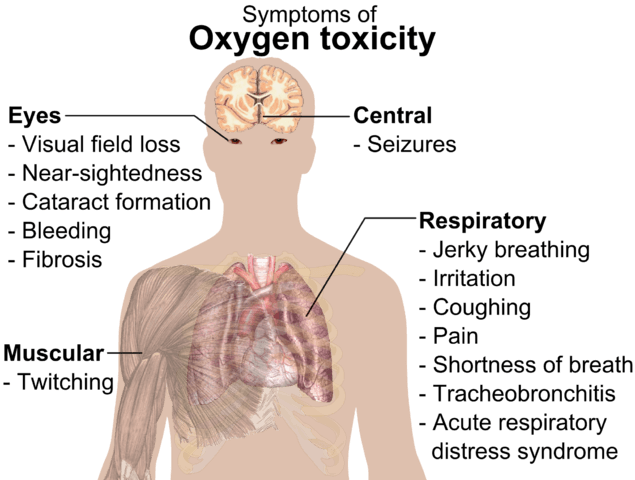 Hyperventilation, is rapid and deep breathing that creates a low level of CO~2~ in the blood. An individual may hyperventilate from an emotional state, such as anxiety, or from a medical condition, such as infection or bleeding. Furthermore, a hyperventilation response can occur in someone that is adjusting from a low altitude to a high altitude—the individual’s rate and depth of ventilation increase to compensate for the reduction in the partial pressure of oxygen. Respiratory depression, or hypoventilation, causes an increase in the concentration of CO~2~ in the blood. Hypoventilation is not the same as respiratory arrest, in which breathing stops entirely, and death occurs due to complete anoxia (complete oxygen deprivation), although both are medical emergencies. Hypoventilation can be deemed a precursor to hypoxia. Oxygen is similar to any drug; its beneficial effects must be balanced against its adverse effects. No drug or supplement is completely without risks.